It is always fascinating when you’re adding to your artbox and learning to combine a completely new set of pencils with your faithful sets. A new art material is like learning to drive – it’s going to take a lot of practice, patience and time to learn the individual features of your new pencil! It’s taken me a while to take the plunge but I’ve been working with Derwent Procolour. There’s so many positives to the range – versatile, strong, bold colours and dust-free being just a few! But how would they compare to Coloursoft, the most popular pencils in my artbox? Heading down to my studio, I took some time to test each Procolour pencil one by one, find more similarities than I bargained for! Although some of the colours match, the pencils do have differences that make them perfect partners. The Procolour pencil range has an indefinite warm quality to it compared to slightly lighter Coloursoft range, mainly due to the make-up of the pencil. Coloursoft has a waxy quality which makes it ideal for blending. Boasting vibrant pigments, both ranges work on well on both on black and white paper, with colours that can appear both warm and cold in comparison to the colours around it: it can be presented as both warm or cold. When working on landscapes and botanicals, the Procolour range more easily applies to the paper, but the Coloursoft does have a stronger textured feel to it, ideal for creating depth and an ’emotional feel’ to landscape works . From a blending perspective, I noticed an interesting result when working on black paper. I applied two sample layers of blue on top of the white pencil with Procolour White on top and Coloursoft White on the bottom. 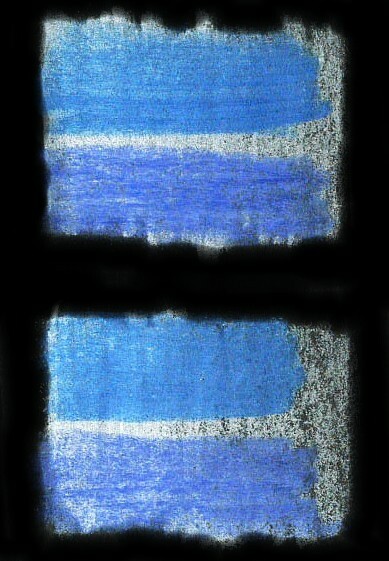 On both these white layers I applied two colours: Procolour Spectrum Blue 34 and below it Coloursoft Ultramarine C290. You can clearly see that the highly pigmented Procolour applies on both whites very easily giving very smooth results. Due to the waxy nature of Coloursoft Ultramarine, it blends into the white pencils, giving a more even tone, making them perfect for seascapes. My conclusion, following extensive work with both sets of pencils is that they’re actually ideal partners, rather than contrasting ranges.. The subtle nature of the Coloursoft range partners ideally with the bold Procolour. The great advantage of Procolour, however, is the combination of the softness and laydown, applying to the paper very easily and smooth. Coloursoft is ideal for blending, creating a variation of colours that is ideal when getting large areas covered on an animal, like my artwork below. When combined with the sharp point of the Procolour range, you can create a detailed texture with a collection of colours and tones. After my examination of both ranges, I decided to draw my next commission piece with a mixture of Procolour and Coloursoft.